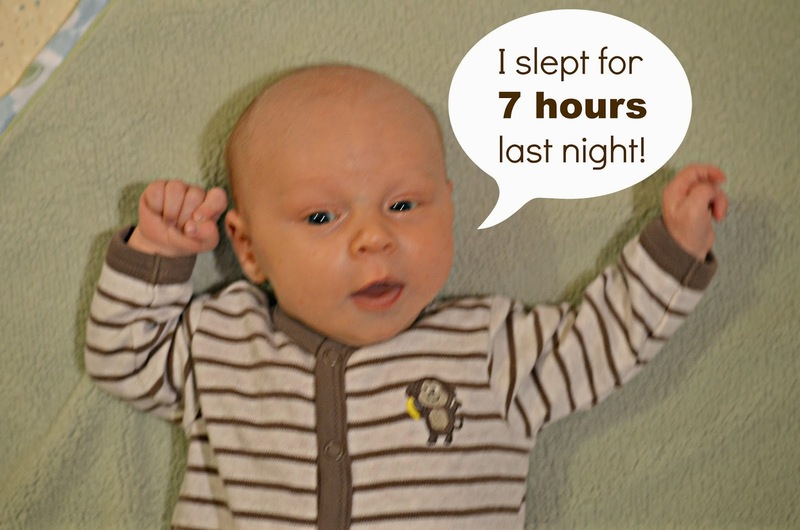 No Wooden Spoons: Dear Judah: 1 Month! If I had to narrow down this past month into one word it would be hugemongeous. You my dear son are hugemongeous! You haven't been back to the Doctor for another checkup since the one at 2 weeks (the next one is at 2 months) but I weighed you myself at home and our scale said you were 11 pounds! That's probably about right, you've been eating practically non stop. We've had some days where you would nurse for 1 hour, take a 45 minute nap, then want to nurse again for another hour. It made for a lot of cuddle time. I'm not going to lie, it was especially exhausting for a few days there. We've become champs this past month at nursing anywhere and everywhere. In the car, at the park, at the BX, at gymnastics, even once in the Ergo on a farm. Yep, that's right IN the ergo, on a farm. We chaperoned a field trip for Ariana and we did what we had to do, nobody was the wiser! You are starting to become more alert and aware. You respond to our voices really well and study our faces. You track us (and toys) and watch Ariana sing and dance around you. We've started including you in Ariana's bedtime routine and you like listening to the stories we read. You've become a grabber and I've learned why mom's cut their hair off short. You have a good grip there and several times I've had to get Daddy to help untangle your fingers from my long hair. This past week you have started to give me little smiles. They are rare, and sometimes I have to work hard for them while other times you just look right at me and smile! It's cute and I've been trying my hardest to capture it on camera but haven't gotten any good ones yet. Only a little bit of one with you sitting by Ariana. I know it's early but you've started "sleeping through the night". On the night of October 10th, you slept for a big stretch of 7 hours. This was a big jump from you waking up every 2 hours to eat. It's happened a total of 3 nights since then! I'm not sure what causes it, maybe you spent enough time eating and being awake during the day that you sleep. I don't know but on the nights that it happens it's wonderful and I enjoy it! Those nights are like treasured gold for my tired mommy brain. We also discovered you like to be swaddled again, so we do. You also like when we sing to you, "Somewhere Over the Rainbow" seems to be a favorite! - You're fitting quite nicely in most of your 3 month clothes. - You are wearing size 1 diapers. - You almost always wear socks, Ariana can't wait for you to wear some of your shoes. - You are starting to loose some of your hair. You are starting to look like you have male pattern baldness, it makes me laugh a little. Can't wait to see if you are going to have golden locks like your sister. - People everywhere admire you. I even had an older German gentleman ran down the street after me cooing at you in the Ergo in German. - I can calm you down from crying just by picking you up and talking to you. When Ariana was a baby she was more dramatic about things while mostly you seem more mellow. - You've had some baby acne but it's clearing up now. It's been a great month getting to know you sweet boy! We are looking forward to the next 11 months of your first year, and many MANY more after that! Hi Cat.... I ended up at your blog while looking for fun fall crafts to do with my kids, and I was surprised to see that you have traveled to all of the same places that we have, which made me think that you MUST live in Germany :-) We live right near Ramstein and have four kids (ages 7, 9, 11, and 14 so a little older than yours! ), and I scrapbook too. If you live close to me, maybe we could scrap some time! Just a thought. Your baby is adorable, by the way.